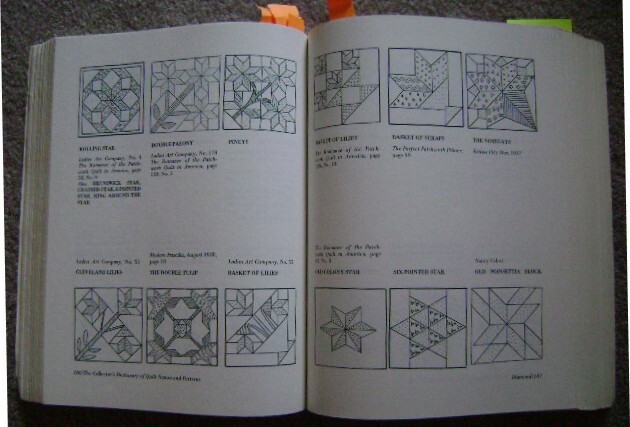 What is Your Favorite Quilt Book? I have more quilting books than any one person should own. I admit it. I haven’t bought myself a new book in a long time. Well, I take that back. I bought Ricky Tim’s Convergence Qult book last winter. But before that, years had gone by without me buying a quilt book. YEARS! That is unreal. Most of my books were purchased in the 70’s and 80’s. OK, I’m old but not THAT old. 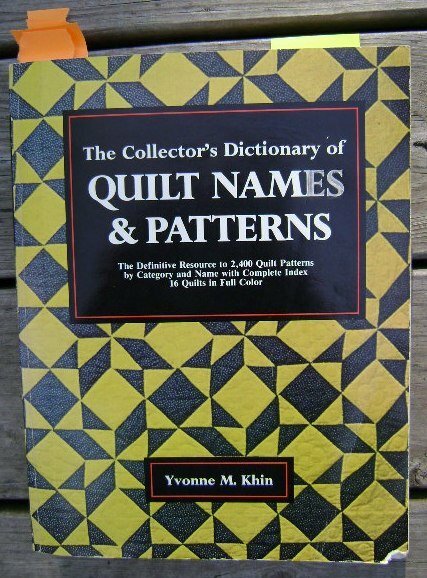 This book, “The Collector’s Dictionary of QUILT NAMES AND PATTERNS” by Yvonne M. Khin is my “quilting bible.” It has 2,400 quilt block patterns. That’s what the cover claims. Actually, they are drawings of blocks, not actual patterns that you can follow to make your own. If you want to make a block, you have to use your own skills to draft it yourself based upon what you see. Some of you might cringe when you think about that, but it is a skill that a good quilter should learn. You can see that I use my book a lot. See the page markers? See the worn bottom right corner of the cover? If you click on the photo of the open book, you can get a closer look. Ms. Khin copyrighted her book in 1980, so when I got it, it was a brand new thing. I loved it! She was born in 1916. The last I knew, she was living in Maryland. She would be 93. Thanks for a super great book!!! Great reference and inspiration book, Caron. Pretend you are all packed to move to another country and can only fit ONE BOOK in your purse. Which ONE would it be? I had to be bring just one book it would be my Dear Jane book because I am not finished with the patterns yet and need it to go by. I actually do not have a favorite though. Wow Great Question. For me it would be The Quilters: Women and Domestic Art : An Oral History by P.Cooper and N. (Buferd) Allen. Whenever I'm in a quilting funk I go back to this one. It reminds me of why I quilt, of what quilts mean to me, and of their importance in time. A quilt to me is a vessel for a little of the quilters soul, heart, energy, and life. This book keeps that feeling alive for me and I'd never move away without it!